Be a farmhand at Randall Glen! Have you always dreamed of having a farm? Growing your own food? Caring for animals? Come to our farm and learn lifetime farming skills…daily chores like feeding and milking, and everything that goes on at each season. Help with plowing and planting, birth a goat kid, bottle feed a baby pig. Cultivate the garden and harvest its fruits. Doctor animals, care for baby chicks, mend fences and plant flowers. 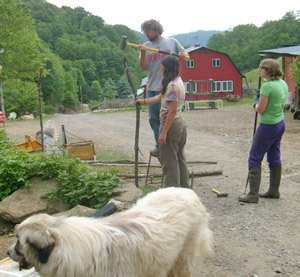 Help with sheep shearing and horse shoeing, learn to make cheese. Search the mountainside for wild delicacies like oyster mushrooms and black raspberries. And while you’re learning we’ll be sharing the bounty of our farm with you-organic produce, farm raised meats, homemade bread, milk, eggs, and cheese. Book one of our luxury mountain cabins with your family or friends. Work with us from 9 AM to 4:30 PM, then spend the rest of the day with your party–luxuriate in the hot tub or head to town. You’ll have a long lunch break every day, and two days free to explore the Asheville countryside. Join our interns and live right here at the farm! We’ll provide a tent site and most of your food, including seasonal produce, eggs, farm-raised meats, wild harvest, cow and goat milk and cheese, as well as grocery staples. Most folks share the cooking, eating, and good fellowship, and there’s often a musician in the group. Laundry facilities and wifi are available. Since every person’s requirements are different, we ask that you provide your own tent.